Mark Weisman is a lot of things. An egomaniac is not among them. All of that from a 6-foot, 242-pound prospect who will line up at fullback in the NFL. “I hit my standards for pretty much every drill,” Weisman said in understated fashion. After an all-state senior season at Stevenson High School near his hometown of Buffalo Grove, Ill., Weisman accepted his only offer, to Air Force, which is one of the few college programs in the nation that make extensive use of a fullback. “I wasn’t going to be a pilot,” Weisman noted. One humorous anecdote from his time at Air Force was how he passed the rigorous bed inspections. Weisman didn’t play at Air Force and, after one semester there, transferred to Iowa, where he redshirted in 2011 as a walk-on. Iowa City was closer to home, a brother attended the school and coach Kirk Ferentz also liked to use a fullback. It seemed like a good fit. Weisman started the first three games of the 2012 season at fullback. But in the third game of the season, fate intervened. Injuries obliterated the tailback position, so Ferentz turned to Weisman, who averaged merely 10.8 yards per rush in his final season at Stevenson. Weisman took the opportunity and literally ran with it. He became the sixth running back in school history to lead the team in rushing three consecutive seasons and the third to rush for 800-plus yards three consecutive times. He finished his Iowa career with 599 carries for 2,602 yards and 32 rushing touchdowns, figures that rank fourth, sixth and third, respectively, in school history. As a senior, he rushed for 16 touchdowns — third-best in school history. He was pretty good off the field, too. He was a second-team Academic All-American, one of three finalists for the Burlsworth Trophy (best senior to start his career as a walk-on) and was nominated for the prestigious Allstate Good Works Team. His intelligence should continue to serve him well, especially at a position in which his blocking assignment oftentimes doesn’t play out like it does with the markerboard X’s and O’s. It’s an easy comparison to see a bit of John Kuhn in Weisman. At Shippensburg, Kuhn rushed for 4,685 yards and 53 touchdowns and was a two-time Academic All-American. 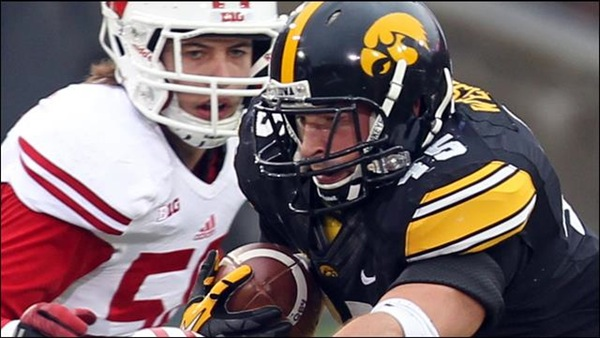 Kuhn, of course, moved to fullback in the NFL, and that’s what would Weisman would do, as well. For Weisman, he’ll have to show he can block — something he hasn’t been asked to do since early in 2012. Weisman will certainly get his shot. If a team is looking for a versatile player in the mold of Pro Bowler Kuhn, Weisman might be No. 1 on their fullback board. Reaching the NFL will cap a remarkable story and bring his winding road full circle — from walk-on fullback to star running back to late-round or undrafted fullback.